It's not often that a car has people questioning your payment methods, but some how the DS 3 Connected Chic managed exactly that - and numerous times to boot. There's a good reason of course (and the answer isn't the car, don't be ridiculous). I've always been a fan of geeky ways to pay and when contactless bank cards first arrived I was beyond excited when my new debit card turned up. But I wanted more. Thankfully, more came. Apple launched Apple Pay, followed swiftly by Android Pay, allowing me to pay for groceries, train tickets and a pint down the pub with my smartphone. It was the future. And then the future arrived on my wrist as smartwatches began to offer the same technology. I was nerd-gaseming left, right and center and the lady at Gregg's* was left starstruck as I proudly presented my Apple Watch to the payment terminal. 'But John, what on earth has this got to do with a car that you're not even paying with?’ I hear you cry. 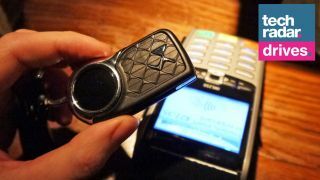 Yep, now the humble car key has entered the contactless payment arena. Available for a limited time only on the Connected Chic trim of the DS 3, the neat little key gives no indication of its payment prowess. There are a trio of buttons to unlock and lock the car as well as to access the trunk. It's a little chunkier and heavier perhaps than most keys, but still easily pocketable. It's not a direct replacement for your debit or credit card, as you top it up with money via the BarclayCard bPay app on your smartphone (you can use any UK debit or credit card to top up), rather than it establishing a direct link with your bank. You can put a maximum of £200 (around $260, AU$340) on the key, and it's accepted anywhere with contactless payment support. Yes, was the reply and my eyes lit up. I had to ask for the bill to be split, as in the UK each contactless payment is capped at £30 (similar limits are in place in other countries) which raised suspicions, but this was only the start. “What's that you're paying with?” our server enquired as I reached for the key, to which I smugly replied “my car key” and held it to the terminal. My heart stopped for a second. Had the key not been topped up? Was it broken? Was it all a big ruse by DS with a Z-list celeb ready to appear behind me and point out the hidden cameras while laughing in my face? "HA! This technology journalist actually thought he could use his car key to pay for food!" they'd laugh as their teeth glittered like C-beams near the Tannhäuser Gate, "What a MORON!" Thankfully, it was none of the above. I was just doing it wrong. Turns out the contactless part of the key is the shiny black disc at the top, and not the body with buttons. A subtle movement of the wrist and I got the approval beep from the machine. Relief, and I'll admit, a fair amount of snugness washed over me. “Oh my god, that's so cool, I'm telling everyone!” And that's exactly what they did. And that's exactly what they did. As we made our way through the dining room towards the exit we watched as our server rushed from colleague to colleague, excitedly gesturing in our direction, explaining our 'magic key’ - sometimes it's the simplest things that are the most satisfying. It wasn't just the reaction of that one person either. Every single time I used the key to pay, the person on the other side of the counter would ask what I was using and then voice their approval of the technology, from the local store to the football ground. Everyone was impressed, and wanted their car key to do the same. Such a simple technology, but one that really connected with people. The key is great, but what about the car it activates? Well actually, it's rather good too. It may only be a little hatchback, but it has a surprisingly punchy 1.3 liter, three cylinder engine that gets you away from junctions, and up the gears on the motorway with relative ease. The seats are comfortable, cabin spacious enough and the infotainment supports Android Auto along with DS’s own navigation system. The controls around the wheel and below the screen are a little clunky, which slightly detracts from the experience, but with the DS 3 Connected Chic starting at £17,395 (around $23,000, AU$29,000) it’s acceptable. The touchscreen was responsive though, making it easy to plug in sat nav destinations and control the DAB radio and music playback. From a technology perspective though it's the contactless payment key that's the real head turner here, and even from the small sample of reactions I got, I believe that this is a feature that would be welcomed the world over. Now it's just up to the car manufacturers to offer it. Chop, chop then, we've not got all day.